Healthy plants are selected and planted. At every stage of growth, the trees are cared for and nourished. Tree-guards are used to protect the trees from animals; fertilized soil is used for cultivation; insecticides are used regularly and watering is made punctual. The quality of work is proven in the results achieved so far. At the same time, this quality is given importance for the huge quantity of plantation. The Trust undertakes massive projects but the quality is maintained. The Trust aims to plant at least 75 Lakh trees across the western parts of Rajasthan. Towards fulfilling this cause, the Trust runs its own nursery which cultivates Neem plants in bulk. Besides this, the Trust also plans to distribute Neem plants free of cost, so that interested people can plant them in large numbers. PALI, Rajasthan, June 5: Taking inspiration from the green cover in the desert area of Israel, a man has taken upon himself to transform the Thar desert by undertaking massive plantation on his own. Legendary Kishore Khimavat was born in Khimel, near falna of pali district in Rajasthan, as the son of Valchandji Khimavat and mother Hulasi Bai on 8 Feb, 1952. His father was a devoted social worker. 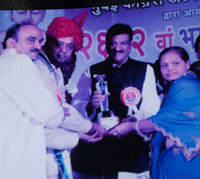 Award given by Pratibha Patil (President of India) to our family on Behalf of Legendary Shri Kishore V Khimavat for his great achievements. We thank you for all your blessings & Support.